Engaged for a remodel that turned out to be an almost complete reconstruction, Clark, whose firm is based in Austin, and Dallas interior designer Emily Summers did much more than just perk up the dreary Tuscan cloister. 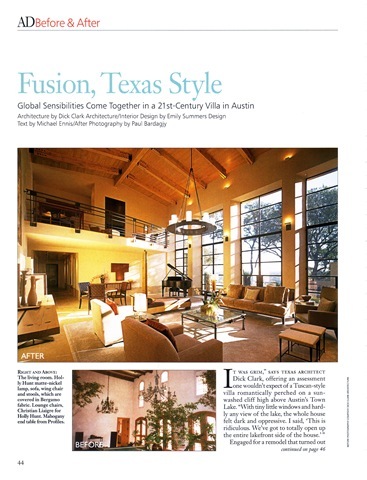 Clark and Summers sweepingly transformed a plodding period piece into an elegant expression of 21st-century modernism, to be an almost complete reconstruction, Clark, whose firm is based in Austin, and Dallas interior designer Emily Summers did much more than just perk up the dreary Tuscan cloister. 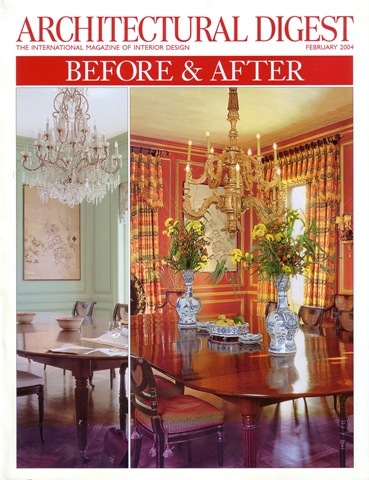 Clark and Summers sweepingly transformed a plodding period piece into an elegant expression of 21st-century modernism, effortlessly translating influences as div erse as local vernacular, classic modern, European contemporary and traditional Asian to create a design as international in outlook as it is intimately wedded to its Texas setting. When he decided to begin work on his own home, he hired two longtime members of Texas’s relatively small but accomplished community of committed modernists. Closely collaborating from the outset, the trio quickly arrived at a consensus: “It was a bad house, but it had good bones,” says Clark, “and we were fortunate in that it was east-northeast facing, so we only had to deal with the morning sun. The orientation was really good to just go toward the lake.” While the footprint of the house stayed, almost everything else went: Stone-veneer ext erior walls gave way to massive blocks of locally quarried Lueders limestone in a rich ocher hue; deeply set window arche s were replaced by sheer, minimalist banks of horizontally banded windows; the Tuscan tiles were supplanted by a more authentically Texan standing- seam copper roof. The biggest surprise—and the most spectacular view—lies downslope, hidden from the main house beneath a sod roof that provides a previously missing rear lawn, as well as a fair-weather setting for the charitable and political gatherings the owner regularly hosts. Built on the site of an old caretaker’s cottage, the Cliff House, one of four additional buildings on the property; variously functions as a corporate boardroom, guesthouse, and media center for the resident teenagers. 1 he cylindrical glass dining room, which wraps around an immense, doughnut- shaped table that Summers designed, is cantilevered over the pooi, providing a spectacular 270-degree vista and the sensation of flying. Explains Clark: “This was just pull out the plugs and do something very European contemporary.